This Realtree Max4 Neoprene Cover from LensCoat is a protective covering designed to fit the Sirui PH-20 gimbal head. Its closed cell neoprene construction helps to shield the PH-20 from routine wear and tear and also acts as a thermal barrier, protecting the users hands from hot or cold components. For those photographing in the outdoors, the cover's color and pattern help to break up the shape of the PH-20, reducing its visibility to wildlife and helping you to hide in plain sight. Box Dimensions (LxWxH) 8.1 x 5.6 x 0.9"
Neoprene Cover for Sirui PH-20 Gimbal Head (Realtree Max4) is rated 5.0 out of 5 by 1. Rated 5 out of 5 by big E from Fits anyway ! 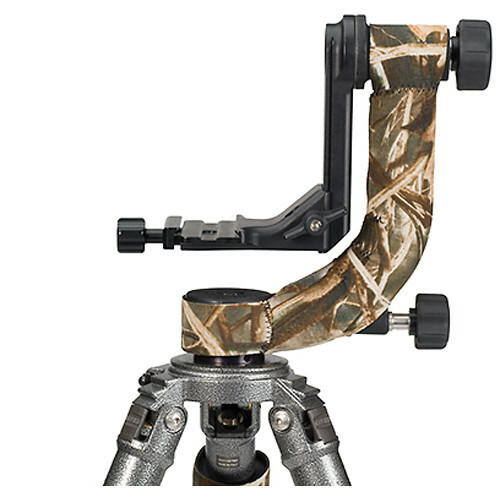 I debated about purchasing this cover because i dont have the exact tripod head that its designed for. So i measured, looked carefully at the great photos provided on the B&H site and decided to go ahead, its not like this thing is $$. So when it came, free shipping by the way, and i tried it out, IT FIT !!!! It has the same freaky super velcro as the leg wraps i also purchased from B&H so its not slipping off. I am very happy with this item.